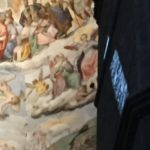 If you’ve even been to a European cathedral, your guidebook may have mentioned some spot on the floor or window on the dome that was supposed to mark special solar and calendar events. Usually these are indecipherable and after a quick squint and a befuddled shrug you moved on. Not this time! 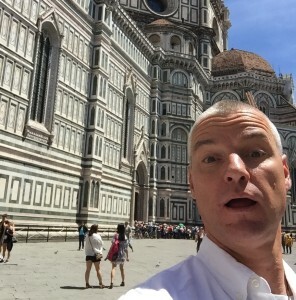 I was lucky to find myself in Florence on June 21 this year. 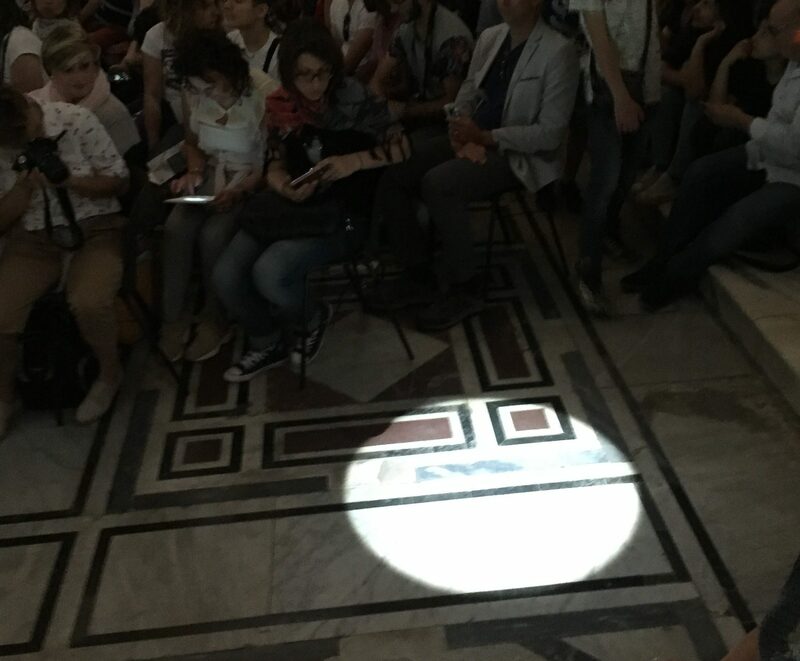 I remembered from my Equinoon project that Florence’s Duomo, Santa Maria del Fiore, had a window at the top through which the sun cast a shadow on a particular spot at noon on the solstice. A bit of quick Googling led me to the Duomo’s website, where one could email and request a reservation to attend this annual event. Score! In Renaissance times, getting a good measure of the length of a solar year was useful for all sorts of liturgical, mathematical and astronomical reasons, not least of which was getting the date for Easter correct as the old Julian calendar drifted further and further out of whack. Although this might seem like a trivial motivation, highly accurate astronomical observations of this sort led to the discoveries of Kepler and ultimately Newton, unlocking the fundamentals of physics, so scoff not! Good solar observations are best made with really big solar instruments – the bigger the sundial (or more properly “gnomon”), the better. And what better huge sundial than a window in a really tall building, essentially a reverse sundial? These windows had the added advantage of providing a flat and stable church floor as a base for measurements. So in 1475 Paolo Toscanelli built a small window in the lantern of the Duomo and now half a millennium later the good folks at the Duomo crack open the window once a year for a 500 year old light show. I didn’t know what to expect but my sketchy invitation said to show up at the “Porte dei Canonici” at 12:30. I guessed, correctly, this meant the church door on the south side of the cathedral that would avoid the tourist hordes mobbing the front entrance. I expected (with my free entry) that I’d be greeted at a discreet entrance by the knowing nods of a few cognoscenti who deeply admired my savoir-faire. No such luck. There was already a line of reservation holders, last-minute hopefuls, and confused tourists crowding the door. It devolved into a scrum of people waiving printouts of confirmation emails, iPhone confirmations, and sharp elbows. Somehow I got in before the seasons changed. Inside the cathedral we were ushered to about 200 seats that were arranged in the north transept around the brass and marble marking on the floor. 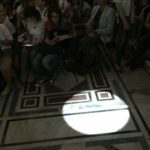 A representative from the Astronomical Society did a great job explaining the event with a presentation that I enjoyed even with my limited Italian. 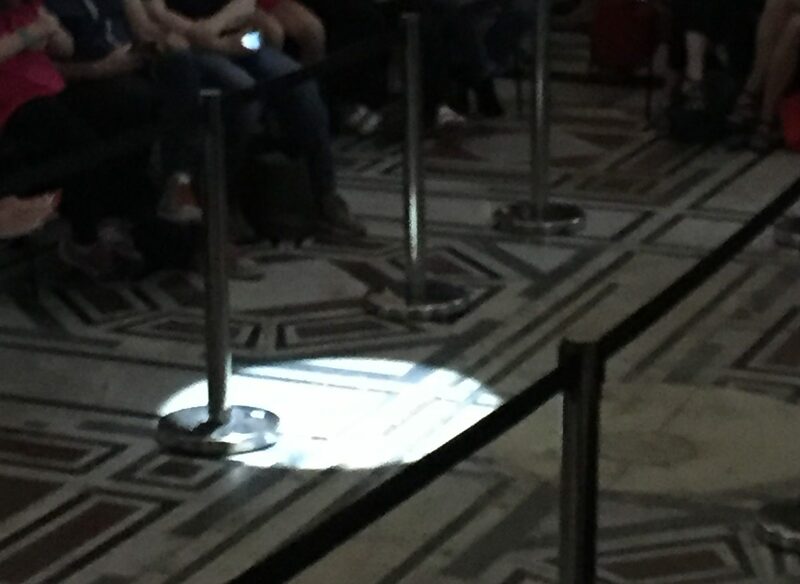 If you looked carefully you could actually see the light moving across the floor. With about five minutes to go, disaster! A cloud moved across the sky and blocked the light completely. The crowd gasped again but the shadow passed after about 30 long seconds and the slow spectacle resumed. At 1:17 the disc of light lined up with the marble and brass inlay – right on time! Why 1:17 p.m. and not noon? For two good reasons. First, Italy uses Daylight Saving Time so 1:00 is really 12:00. Second, Florence is a bit west of the geographic center of its time zone – every time zone is a compromise and solar noon hits the western parts of a zone a bit late. Here’s a photo of the light just a few seconds after solar noon. You can see the brass and marble marker to the right of the light. The geotag on my photo shows it was taken at 1:17 p.m. How cool is that? 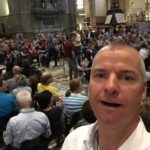 Also, since the window is in the center of the dome that’s centered over the north-west oriented transept and the noon light disc hits the center aisle, it shows how precisely the cathedral is set up in relation to the cardinal directions – nice! Despite the chaos at the door the organizers did a great job. It’s a shame that there were very few children in the audience (are there any in my photos?) The solstice is a great key to unlock understanding of geography, the seasons, the solar system, the Renaissance, geometry, trigonometry, and calculus. Let’s get more young people there next year. This was one of the most interesting tourist events I’ve ever attended. 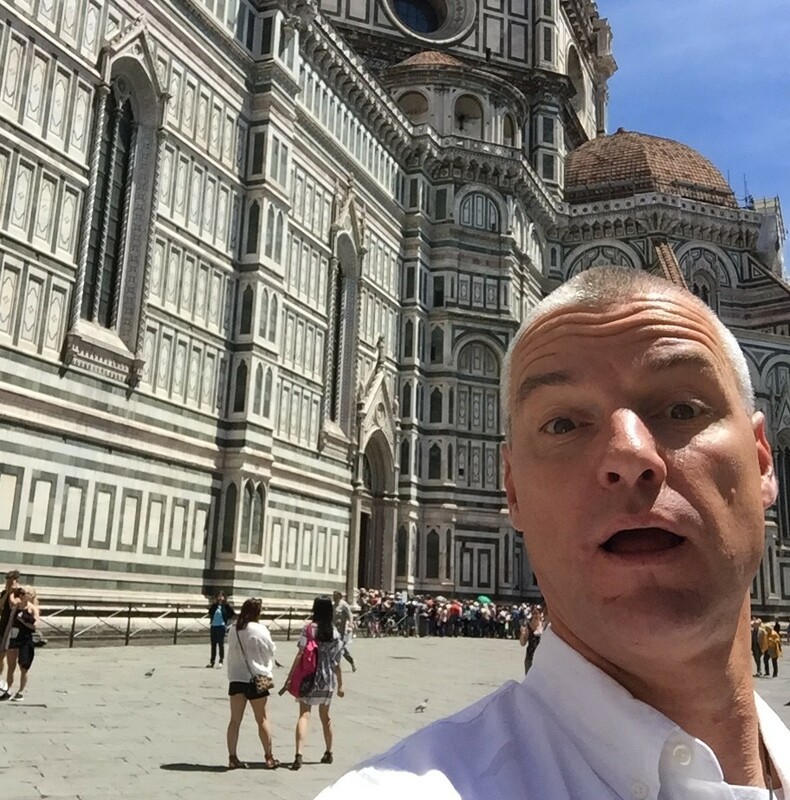 I highly recommend it to anyone who can get to Florence, Italy on the summer solstice. For more information check out the Duomo’s website, operaduomo.firenze.it as the event approaches. And if you can’t make it to Florence, plan on doing your own solar observations on the next fall equinox, September 22, 2016. See my Equinoon post to learn how, www.markslavonia.com/equinoon.